Some Trader’s Tokens from 19th Century West Africa. A talk given to the London Numismatic Club, on the 5th June 2007, by John Roberts-Lewis. 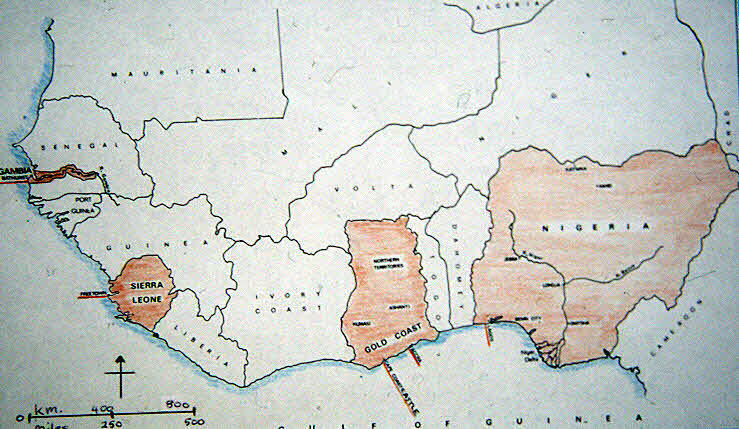 British interests in West Africa involved Trading Companies and Figure 1 shows the situation in the 18th Century to 19th Centuries. Supplies of British coinage were erratic and “primitive money” such as cowries, which had been in use for a long time, provided small change. Spanish-American silver consisted of whole and cut fractions for higher values. Despite the dismal state of the latter through forgery and clipping, it appears that traders had little need of tokens and only three businesses issued them. One was from Sierra Leone, a second for use throughout the Niger Basin and the third for Lagos. 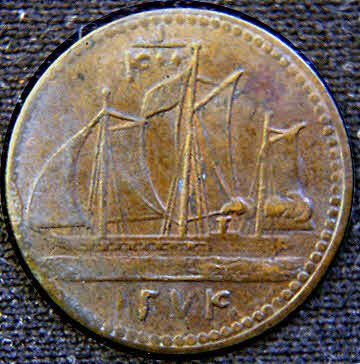 Figure 2 shows the obverse and reverse of a lead alloy piece for Matagong Island and apparently Liverpool, however unlikely this seems and it is for three pence and dated 1855. It was issued by Isaacs, Reader and Co, who had a Trading Station sixty miles north of Freetown in Sierra Leone. Nathaniel Isaacs, an Army Contractor, is said to have bought the Island in1825 to use as a cattle holding area for the Freetown market. It became effectively a “Freeport” with wharves and stores and no taxes payable by visiting ships. The main exports were palm oil and “groundnuts” or peanuts as they are usually called now. Kennedy, the British Governor of Sierra Leone, suspected Isaacs of trading in slaves, though he was the French Consular agent and had paid for a Methodist Chapel to be built In 1854 his arrest was ordered , but forewarned he had gone, leaving behind slaves, whips, etc, and their prison. He fled to England and established offices in Liverpool, whilst Thomas Reader his Partner, a former Methodist Missionary looked after the Company’s interests in Africa. Attempts in England to bring Isaacs to trial failed and in 1859 he even revisited Sierra Leone. The partnership was dissolved in1860 and Isaacs died in 1878. A curious episode is reported concerning British troops being defeated when trying to seize Matagong Island where a local Chief claimed the slaves were his. 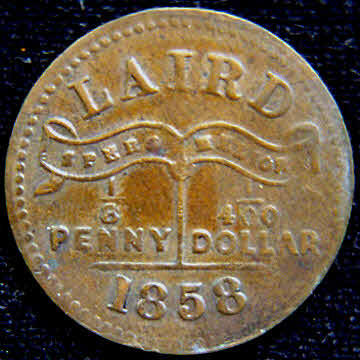 The obverse of a copper token issued by Macgregor Laird is shown as Figure 3. It and 1/400 Dollar shown on the token are derived from the rate of 80 cowrie shells to a penny and four shillings (48 pence) to the dollar. Rates fluctuated, but this was a successful and genuine attempt to provide a very low value token. 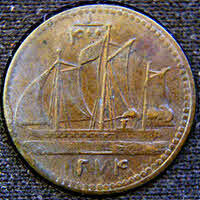 It was not until1907 that a 1/10 penny was officially issued for Nigeria and British West Africa. Figure 4 is the reverse and shows a ship under sail, but also using steam power, though the smoke is shown going in the opposite direction to the wind which is filling its sails. Above is the 1/400 value in Arabic script also used for the date of AH 1274 equivalent to 1858. There are two distinct obverses and Figure 5 (from a poor catalogue reproduction) shows a different scroll arrangement compared to that on Figure 3 and the reverse has a ship under sail but no smoke. Little is known about the brass token shown as Figure 6. No trace has been found apparently of documents mentioning the Gilruth Brothers in Nigeria or Britain. 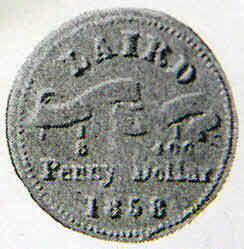 Lagos was annexed to the British Crown in 1861 and the obverse head of Victoria is similar to those used in Britain on issues such as card counters, during the period 1870 to 1880.